We rested here for three quiet, cool, sun drenched days. 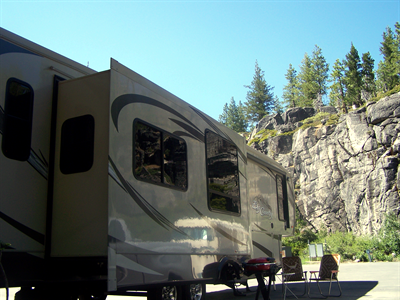 We stayed in a paved area called the cliffs which was quite nice as there seemed to be fewer bugs and more sunshine. 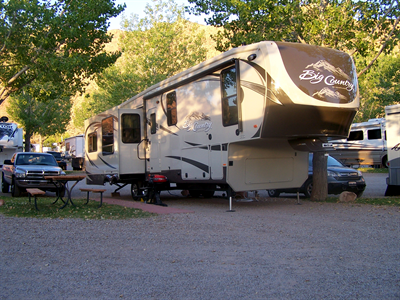 The campground is in a mixed forest, that is there are many varieties of both hardwoods, angiosperms, and softwoods, gymnosperms, located a mile or so off Interstate 80 near Emigrant Gap, CA. We took a number of short walks in the park. On one our walks we found the nice alpine lake that the park takes its name from. 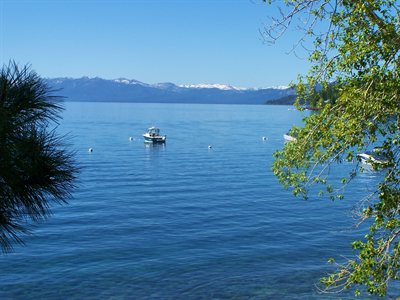 The second day we took a drive to see some of Lake Tahoe. On the way back we stopped in Truckee, CA (a fun tourist trap town) where Elaine got her nails done and we did some tourist shopping. We found and purchased another egg beater in a kitchen gadget store!! They do still make them. Elaine now has a lifetime supply. 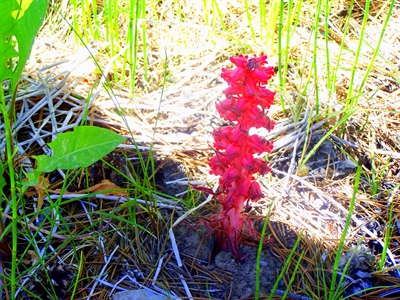 On another of our walks in campground we were lucky enough to find a snowflower, the flower the lake takes its name from. 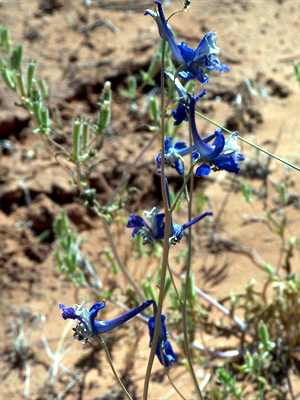 These flowers are incapable of photosynthesis and get their nutrients through a symbiotic relationship with a fungus. 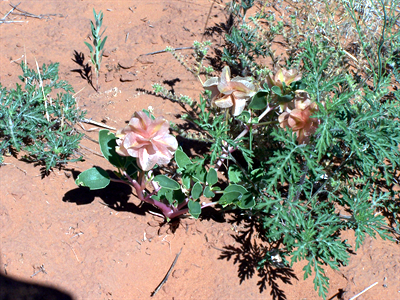 They essentially steal sugar from tree roots with the help of the fungus and supply carbon that is needed by the tree. Most interesting. From here we are off to the Russian River near Cloverdale, CA. We will spend a number days from that base exploring the redwoods, California wine country, and some of the northern California coast. The early bird gets the worm but the second rat gets the cheese. Life isn’t fair, enjoy it anyway. We reluctantly left Moab, Utah heading for more adventures. 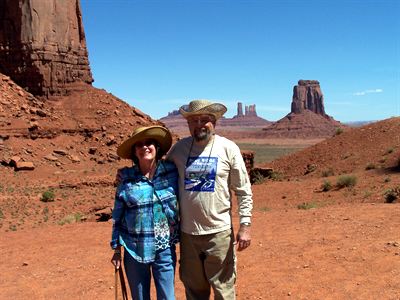 The Moab area has so much to offer and we barely scratched the surface but we have plans and therefore a schedule. Hopefully we will make it back this way again on another foolish folly. I certainly do not mean to deprecate our travels or desire to travel, I simply wish to emphasize that we are doing what we want when we want to do it. So whether it is foolish folly is in the eye of the beholder and I do enjoy seeing it as such. At any rate we are headed to Springville, UT for no other reason than it is about the right distance for a day’s haul and in the general direction of our trek to Oregon. 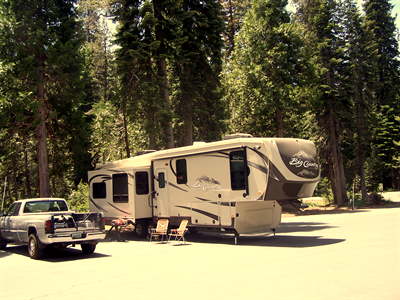 After an uneventful (that is the best kind) drive we got set up at East Bay RV, a pleasant “parking lot” campground. Just fine for a night on the road. All paved, easy pull through sites with well thought out hook-ups, and clean so I won’t complain. We decided to go into town to look around and fill the truck while unhitched. We found a pleasant museum of local history and did some shopping which led to buying some sprouting supplies. We do miss our garden and had not grown sprouts in years so we will be gardening in Bertha. Who would ever have thought of having a real veggie garden in an RV? 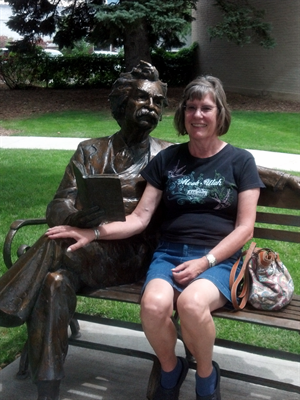 By the way, just outside the museum Elaine found a new man-friend. He didn’t say anything at all but I understand that he is a very prolific writer. The plaque said his name was Mark Twain. I don’t understand it but Elaine seemed quite smitten with his charms. 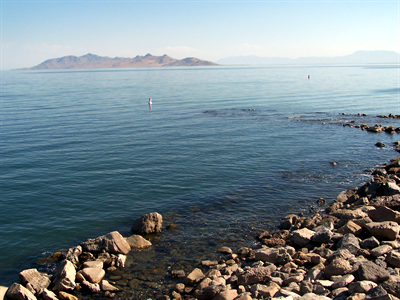 The next day we headed through Salt Lake City and then west past the southern end of Salt Lake. 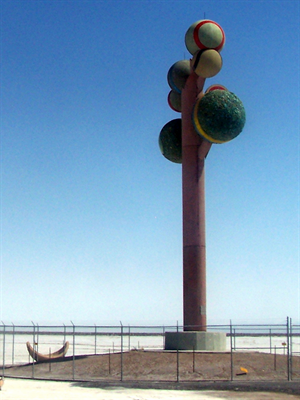 I really did not find much information about this artwork but evidently a Swedish sculptor, Karl Momen, bought a small piece of land near I80 about 26 miles east of Nevada and erected this sculpture in the mid 1980’s and gave it the name, “Metaphor: the Tree of Utah and went back to Sweden. There are a number of “Do Not Stop” signs on the freeway but luckily Elaine was driving so I was able to catch this picture on the fly. We stopped to change drivers at the Bonneville Salt Flats. That brilliant white is salt. 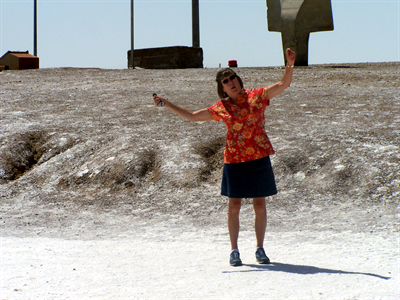 As you can see Elaine was quite excited about being here and standing on the salt. Or maybe she just thought that it was funny that Gordon had just remarked “It really is salt”. I don’t know why but I had never realized that the salt flats really were a thick crust of salt and not just white sand. I must have been day dreaming during that geography lesson. 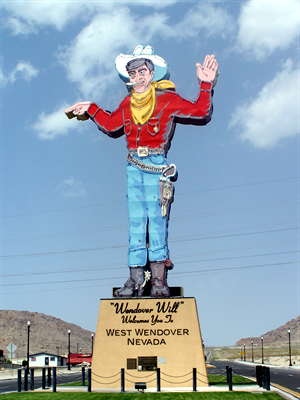 A few miles later we were in Nevada being greeted by the iconic 90 foot tall “Wendover Will” who has been waving to all who enter or leave Nevada via West Wendover since 1952. He was originally built to promote the Stateline Casino but now belongs to the city of West Wendover. 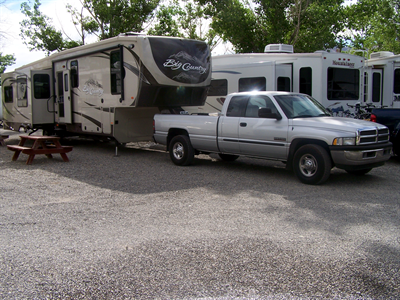 After lunch we proceed to Wells, NV and Angel Lake RV. 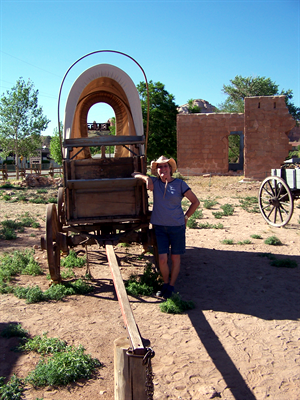 We had already filled up the truck on the way through town but since we had to un-hitch anyway because our campsite was not at all level, we drove through town and checked out a couple of stores without finding anything we could not leave behind. I should mention that Bertha is working out very well and we are very comfortable. We have so much more living space and the kitchen is great which is very important to us as we prefer to eat in and stay healthy as opposed to a steady diet of restaurant food. Though we do succumb to ice cream, licorice, and Chinese food (but not at the same time) regularly. After passing through Reno, NV without even getting off the freeway we continued west and up the mountains into California. A lot of miles in a few days, but we are now in the Sierra Nevada Mountains near Emigrant Gap, CA where we will spend a few days and it is splendid. 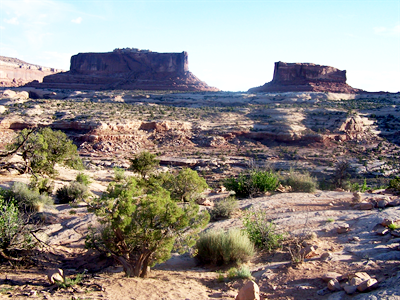 No vacation type travel through eastern Utah would be complete without seeing Canyonlands National Park. I will note that I found it particularly difficult to portray the grandeur of this magic place. It really must be experienced in person. Though not actually in Canyonlands I thought these elephantine rocks that we passed on the way into the park deserved a picture. 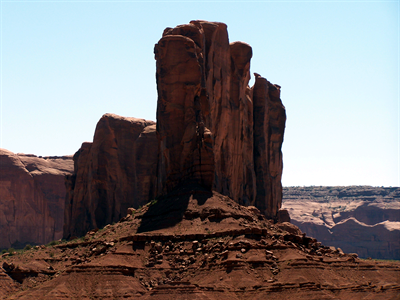 Known for its tall mesas, steep cliffs, deep valleys, and enormous vistas Canyonlands also has some magnificent rock formations. The road you see winding down the cliff and through the valley is definitely for four-wheel drive vehicles only. 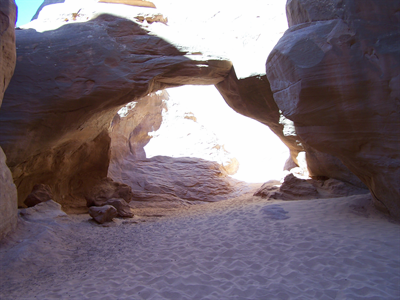 It is a total of 10 miles long and it is recommended that you plan for at least 24 hours to traverse it! This is a 180 degree panorama that I made from 7 pictures of the sight from the Grand View Overlook. We only saw the northern portion of the park, the Island In The Sky District. Maybe on another of our meanders we will see the southern portion. Even when you are retired you simply do not have enough time for everything. 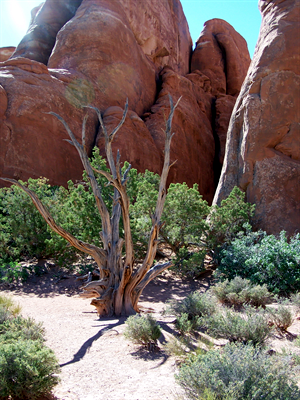 One of the goals of this escapade was to finally see at least some of Arches National Park. Last year we made the decision to see Bryce and Zion as they just fit better with that trip. We are definitely glad we made that decision, because it allowed us to see another side of this definitely “WOW” state. Hold on to your hats, this side has must see destinations too. It almost makes you nervous to stand near this monolith. 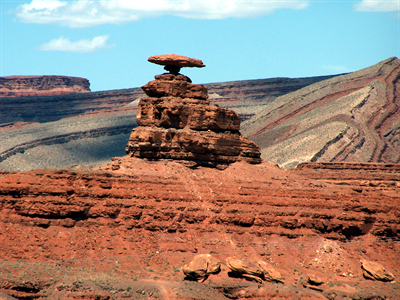 The overall height of this structure is 128 feet with the rock on top at 55 feet. 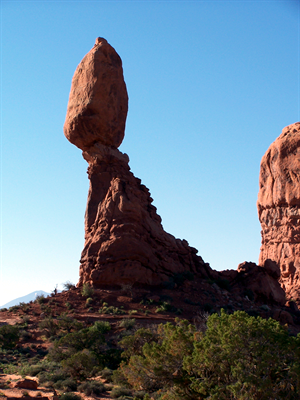 The rock has the mass of three school busses and is perched on much softer rock from another geological era. This was our second stop (that is Elaine up ahead) If you look closely you can see that this is actually two arches in one. A short hike through loose sand took us here, my favorite site in the park. Named Delicate Arch because of the fault in the middle it really is not delicate at all as the two “halves” are held together by gravity. 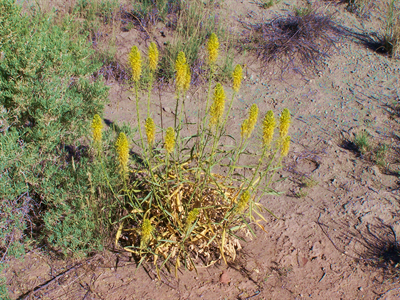 There are many other interesting things to see in the park. 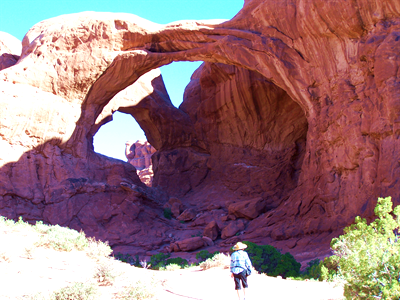 We spent a glorious day at the park viewing a few of the more than 2000 arches and many other awesome works of nature. Don’t take life to seriously, just put a smile on someones face and it will make you happy. 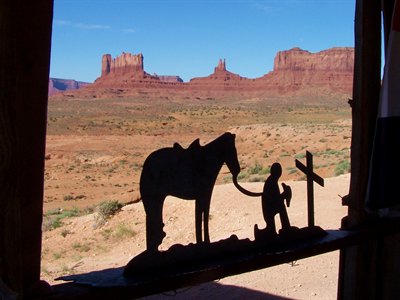 It is only a few miles up the road but we moved our base of operations (I like that it sounds so official) to Moab, UT to see Arches National Park, Canyon Lands National Park, Dead Horse Point State Park and Moab. Another nice site with another great view. Wish we could be so lucky all the time! It is hot here, high 90’s and low 100’s, as it has been everywhere and we don’t expect it to cool down any until we get to the Sierra Nevada Mountains in a week or so. The drive up was fun. Believe it or not we stopped, 5th wheel and all at a community yard sale in a park, a garage sale that looked interesting (where we got some cabinet pulls for a project) and at a farmers market. We passed up some picture stops on the way because we thought we would be going there again, but it does not look like we will. Oh well, Ce la vie. We did stop for this interesting rock formation and to let some people who wanted to travel faster than the speed limit get by. 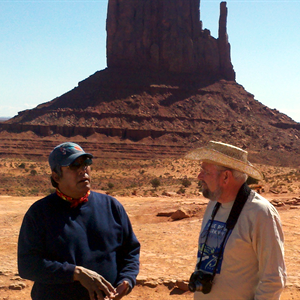 On the day that we went to Canyon Lands we stopped at Dead Horse Point on the way back to the rig. Dead Horse Point is about 2000 feet above the Colorado River and it is almost an island in the sky as it linked to a large mesa by an isthmus only 30 yards wide. By the way there are no guard rails at the isthmus just sheer cliffs of 2000 feet on each side. Any way the picture is 120 degree panorama looking down to the Colorado River that I captured on my camera. I am sure there are some really great pictures on the web but I hope this one gives you some feel of the awesome grandeur of this place. I will soon be posting our adventures at National Parks. Until then enjoy your own follies as no one else can. 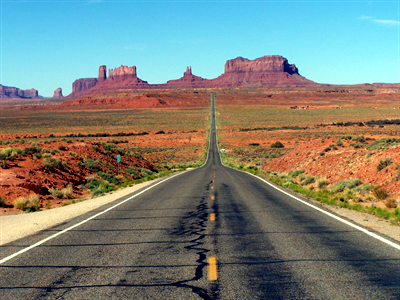 This is the road into Monument Valley made famous in a scene from the movie Forest Gump. It also appears in the movie Thelma and Louise and maybe others. 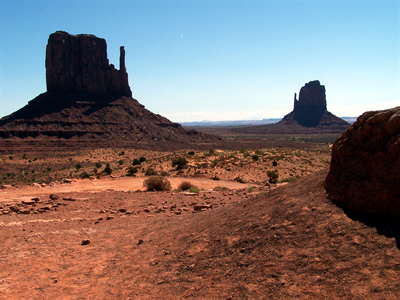 The valley provides the backdrop for many movies and we could certainly see why as there are so many remarkable rock formations and the views are breathtaking. For John Wayne fans this is the place as Stagecoach, John’s first western, and many subsequent westerns were filmed here. 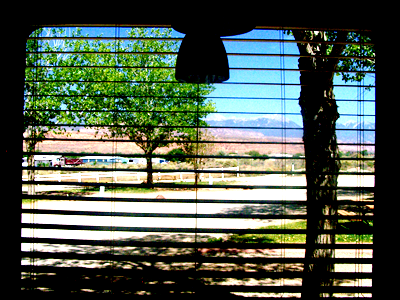 We stopped at a jewelry stand on the way and I took this shot from inside while Elaine browsed. 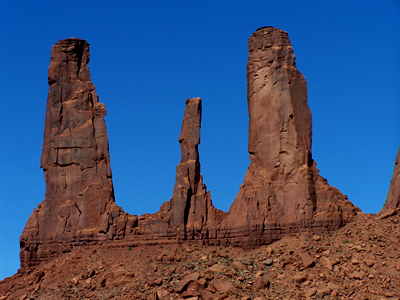 The first rock formations you see when you enter the valley are the two mittens. Of all the formations I liked this one the best. We took a short guided tour which was quite good. We were glad that we took the short tour as the temperature was high and the road was rough enough that we had to hang on to be relatively comfortable. So we were able to see enough to get the flavor without killing ourselves. There are many pictures to see on the web so we will be able to “go back” and look anytime. After the tour we went to Goulding’s Resort for lunch (good), visited the Goulding Trading Post Museum (great), and shopped their fine gift store. 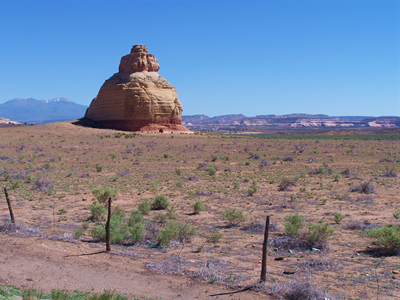 On the way back to Bluff I took this picture of Mexican Hat Rock near the town of Mexican Hat. 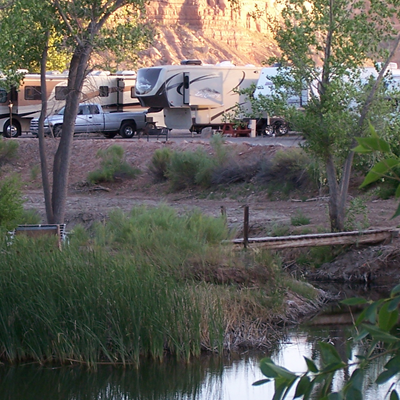 And, this panorama of the Goose Necks on the San Juan river. That is one winding river down there at the bottom of a 1,000 foot deep gorge!! 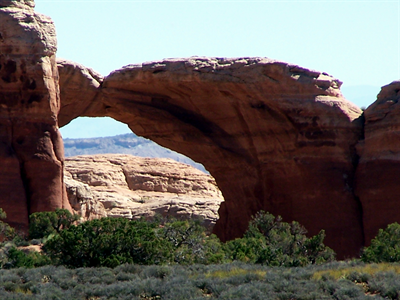 Tomorrow, June 8th, we will move on to Moab, UT to see Canyonlands and Arches National Parks. Smile, it will make someone happy. From Show Low, AZ to Bluff, UT without playing a single hand of poker, another 300 miles with no mishaps worth mentioning. 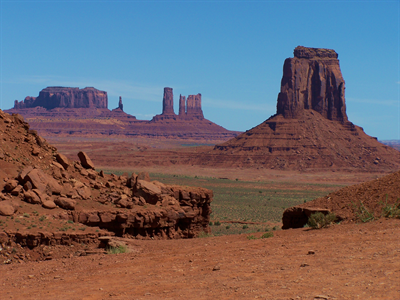 Bluff will be our base of operations for exploring Monument Valley. Up to Interstate 40 at Holbrook, AZ, (and yes, for those that worry about such things, state route 377 is a good road for rv’s) top off the fuel tank and, with Elaine now driving, east to Chambers, AZ to catch 191 north. Oops, no detour markings until you get to the end of the exit ramp. The bridge across the freeway had been removed. Down the entrance ramp and back onto eastbound 40 to the next exit, take that, cross over, and head back west, take the exit and finally we are back on track. Remote high desert scenery all the way to Ganado, AZ where we decided to switch drivers and double back a few miles and go to the Hubbell Trading Post. 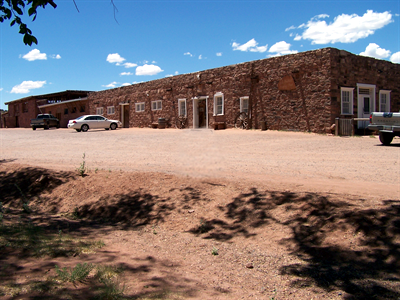 This is the oldest, still active, on reservation, trading post in existence. 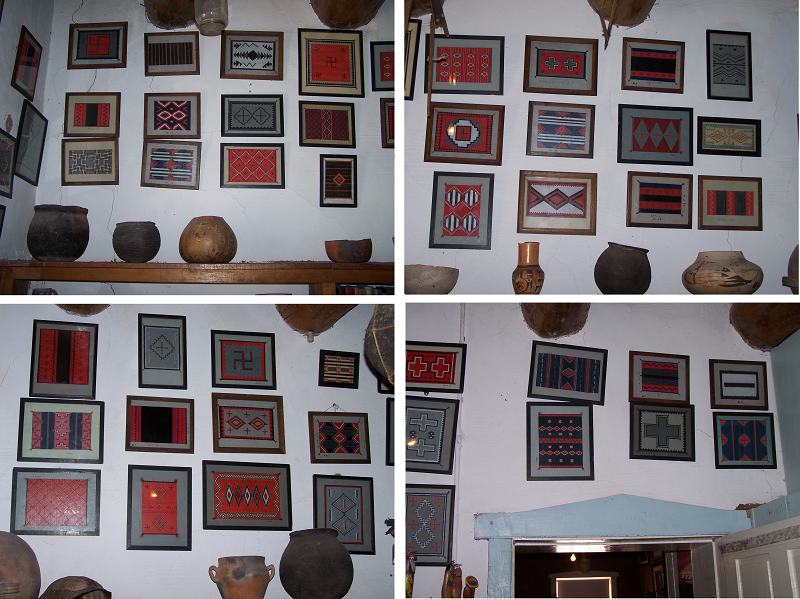 Here we saw a lot of very fine pottery, baskets, rugs, jewelry, and hand spun wool in addition to the small store with food and other supplies. Afterward we walked around the grounds and went to Visitors Center / Bookstore where Gordon found the two best books on the trees of the southwest that he has ever come across and Elaine found a nice book on Kachinas (Navajo spirit effigies). So of course we purchased a little more reading material. Then we ate lunch in the rig before restarting toward Bluff. Where we got a really nice site! 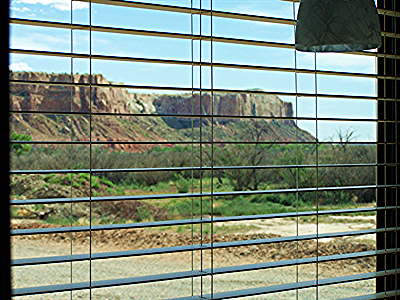 With a great view from the dining room window. After getting settled in we walked to Bluff Fort, which is a really nice museum of the first white settlers in the area including wagons, log cabins, furnishings, and pictures. They also have a short movie about the trek. Boy do we have it easy! We covered about the same number of miles in 6 hours as they did in 9 months and we did it effortlessly in air conditioned comfort. 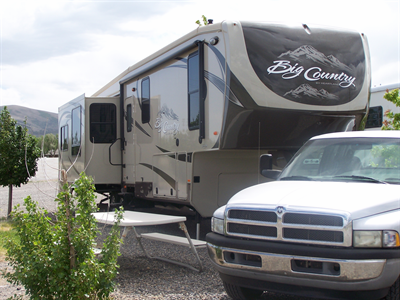 Afterward, we went back to the rig for dinner and to rest up for the next days trip to Monument Valley. May your adventures bring you happiness.